Budweiser recently released their 2019 Super Bowl commercial, and it features the famous Clydesdales, the iconic Budweiser Dalmatian (named “Bud”), and a most-surprising element that no one expected to see. 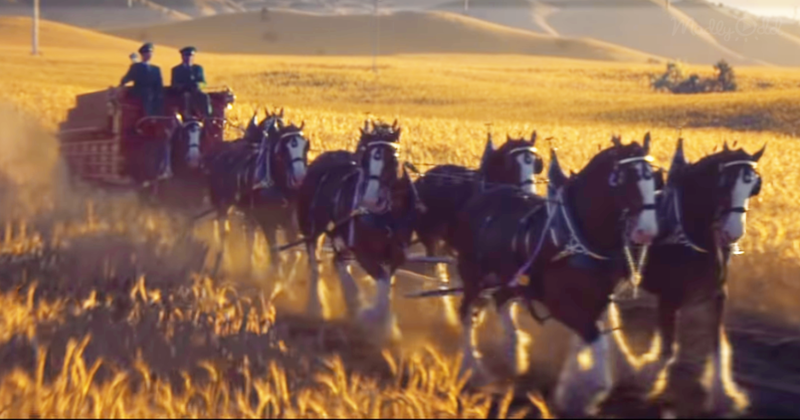 The Budweiser brand has had many commercials in the past, a lot of them have used the Clydesdales, which they are now considered a classic and nearly vital element of their ads. This one-minute video commercial begins with a proud Dalmatian, his ears and the mouth flop carefreely as the camera angle slowly changes and re-focuses to show the dog riding on top of an old-time Budweiser carriage that is being pulled by several horses, Clydesdales to be precise. The song that plays in the background of this beautiful scenery is Dylan’s “Blowin’ in the Wind.” Here are some of the profound lyrics of that song that appear in the clip. The camera follows the beautiful Clydesdales but at the same time, also showing us a broad field that appears to be the home of several wind turbines that are spinning. It is now that we understand the right message behind the beautiful scenery and the lyrics of the song. The company is stating clearly and loudly that it is now using renewable energy and plans to incorporate that in every single one of their breweries by 2025 — a beautiful message for a noble environmental cause. Join the discussion going on below and share this with a good friend if you, too, appreciated this beautifully-delivered piece from Budweiser.